PRINCETON JUNCTION, N.J.–Feb. 14, 2017– Creative Marketing Alliance (CMA), a full service, award-winning, strategic marketing and integrated communications firm, has been recognized with an award for excellence in social media by Association Trends, a leading publication for trade groups. 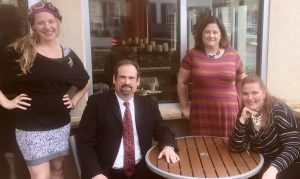 The CMA public relations and social media team: (L-R) Jen Samuel, public relations and social media specialist; Kenneth Hitchner, public relations and social media director; Greta Cuyler and Vikki Hurley-Schubert, both public relations and social media specialists. CMA will be formally recognized at the Salute to Association Excellence luncheon on February 23rd at the Capital Hilton in Washington, D.C. The goal of the award-winning social media campaign was to improve the International Card Manufacturers Association’s (ICMA) brand awareness and increase strategic relationships to support its mission. ICMA is a trade group of card manufacturers, personalizers, suppliers and related industry participants. With 225 members globally, ICMA serves as a resource for industry issues, including the production, technology, application, security and environmental challenges of cards. The yearlong campaign increased annual conference registrations by 16.4 percent (340 vs. 292) and increased annual conference exhibitors by 47.7 percent (65 vs. 44). CMA refreshed all of ICMA’s social media channels, including Facebook, Twitter and LinkedIn, giving a cohesive look to all channels unifying the brand. Compelling posts were composed on each channel, strategic hashtags were researched and incorporated and all the artwork on each channel was updated to create a consistent online experience that supports ICMA’s brand. Website traffic grew: Users (+15.2 percent), sessions (+18.9 percent) and pageviews (+12.3 percent). Chinese visitors increased 22 percent, which was the largest increase in the last five years. Social media referral up 42.6 percent for Facebook, LinkedIn and two Twitter accounts. Increased annual conference registration by 16.4 percent (340 vs. 292). Increased annual conference exhibitors by 47.7 percent (65 vs. 44). Twitter and Facebook generated 920,863 impressions resulting in 7,646 engagements and 937 link clicks. Twitter and Facebook total reach for the year hit 11,283,339. Total fans increased by 408 percent on Facebook and Twitter with 2,307 new fans, or 1,763 new followers on Twitter and 96 new fans on Facebook. Engagement on Twitter and Facebook channels increased by 2,078.3 percent with 1,179 total Facebook engagements (an increase of 291.7 percent from the previous year) and 6,467 total Twitter engagements (an increase of 12,834 percent from the previous year). CMA’s entire marketing and communications division is dedicated to building an organizations’ value proposition and increasing their reach. Barnhart’s company practices a “Growth Engine” mindset, which leads to business growth through creative strategies, such as a strategic combination of traditional and digital marketing. In addition to earning more than 325 awards for the work CMA has produced throughout the years, Barnhart was named the first Entrepreneur of the Year by the Princeton Regional Chamber of Commerce in 1993. For more information about CMA, visit the firm’s new website at http://CMAResults.com. Creative Marketing Alliance (CMA) is a full-service, award-winning strategic marketing and integrated communications firm that builds reputation, relationships and return on investment. It creates and manages results-driven marketing programs using Marketecture, a strategic analysis that helps clients understand how their company can best be positioned in the marketplace. For 30 years, CMA has provided innovative solutions, which include public relations, social media marketing, and publications along with an in-house studio for digital and creative design. If you’re expecting results, please visit www.CMAResults.com, call 800.852.4269 or email us info@cmasolutions.com.